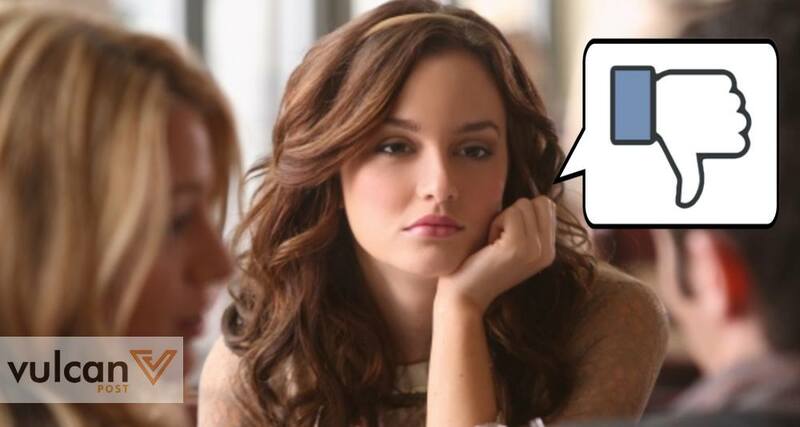 So you want to unfriend someone. The art of pruning your Facebook friend list is something we all seek, yet its secrets have yet to be revealed to the world. Without a clear method of deleting social media friends, the youth of this age are lost and uninspired. To tackle this problem, here is a proposed method based solely on the beauty of maths and scientific elimination. What value does this friend bring to you? On a platform where you can get overwhelmed by too much information, categorising your Facebook friends by measuring the value that these people give you is the first step to simplifying the process of unfriending. Feelings of guilt and morality will only hold you back from your quest to unfriend, so set those aside once you’re done and before you actually interact with real people. To make it easier for us to understand this value, we give it a notation of FB — 1FB is a single FB friend score value. Each FB friend thus has a designated FB friend score ranging from 0FB to ∞FB. This is math, folks, not your next viral microtattoo. This notation will help acknowledge that your curated friends list on Facebook each bring some benefit to your everyday life, online or off. There is no set score for each of these values; you decide how much value each positive value attribute brings to each person’s total FB friend score. What could decrease that FB friend score? People could also decrease the value that they provide you. They might be too negative, post inappropriate things, or are just downright freaking you out with their clinginess. They’re always complaining, spreading their anger and frustration to the world. Yes I’m looking at you, person-who-used-to-curse-your-mother-on-the-Internet. There’re already enough cynics in the world; I definitely don’t want the people spreading bad energy to stay on my Facebook. You can Freedom of Speech somewhere else. This person spreads rumours, constantly criticises your decisions, posts inappropriate comments on your pictures or posts, and purposely picks fights over a simple picture of your cat. Okay, this one’s me. We might have been good friends once. But if having you around on my FB feed just drudges up bad memories, perhaps it’s best to let that friendship go. You know that guy who won’t stop messaging you on Facebook, liking all your photos, commenting on everything, and even trying to FB call you at 2am? These people are bad news, and while you may try to be nice and accommodate them at first, you’ll eventually have to draw a line and say no. We get it, you’re better than us because you’re a vegan who does CrossFit. But constantly announcing your perfect lifestyle on Facebook is getting on my nerves and I don’t want to look at your perfectly crafted lunches anymore. What is your Unfriend Threshold? 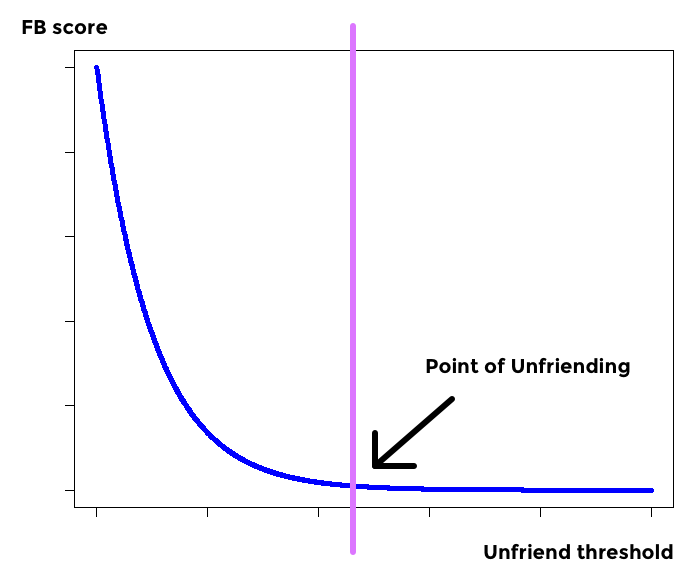 The Unfriend Threshold is the FB score that you set which determines whether that person stays an FB friend or not. For example, Susan may post annoying self-glorifying pictures of her new blender (-4FB), but she’s a childhood friend that has stuck with you through your tough times and her nostalgia potential is way too high (+8FB). She also has a cute cat, which she posts pictures of in cute little hats (+4FB). That gives Susan an 8FB score, which is above my Unfriend Threshold of 5FB, so she stays. Ricardo, on the other hand, may be an old friend (+8FB), but he always posts annoying and inappropriate comments on my wall (-7FB), even if he is quite cute (+3FB). That gives him a 4FB score, so he’s instantly unfriended. When you see a group photo on your feed, but can’t tell which person in the picture is your Facebook friend. Oh come on, why would you keep them on Facebook if you won’t even say hi to them IRL? After accessing the negative and positive FB score attributes, you should end up with a legitimate Unfriend guide and model that will help you categorise your friends in a way that will make the decision to friend/unfriend much easier. Is this method cold? Maybe. Efficient? Most definitely. But the beauty of this mechanism is that everything is really up to you. Perhaps entertainment value matters more to you than actually knowing the person. Maybe keeping an industry contact is more important than the posts they share. Either way, you’re free to define your own criteria for an FB friend scoring system as well as set your own Unfriend Threshold. 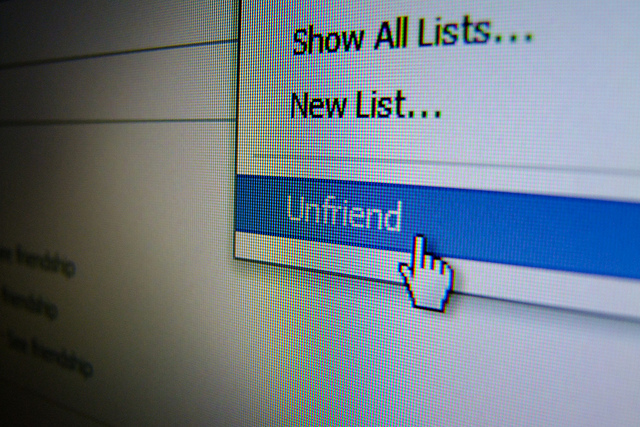 The person who decides whether to click that unfriend button is you. Ultimately, the fact that you’re reading this means that there are some people you know you would prefer to unfriend, and you’re on the fence about it. But the truth is that wanting to unfriend someone is a totally legitimate thing to do. It doesn’t make you a bad person, or a judgemental one. It makes you someone who’d rather curate their social media platform carefully. And let’s face it, there are more important things in life than Facebook.